Festival tour of Bhutan : Festival Tours in Bhutan is an ideal opportunity to witness "Tsechu" or religious festivals, which are held annually at various parts of the kingdom at different times of the year. Many visitors come to Bhutan to enjoy the most popular festivals, which are held in Paro in the spring and in Thimphu and Bumthang in the fall. Festivals are well worth attending because they give you a different sense of the Bhutanese culture, plus they're fun and entertaining. Due to the interest in the festivals, these are the busiest times of the year for tourism. If you wish to attend a festival, we strongly suggest that you book your trip well in advance, as seat availability on Druk Air is limited. Festival Tours in Bhutan is an ideal opportunity to witness "Tsechu" or religious festivals, which are held annually at various parts of the kingdom at different times of the year. 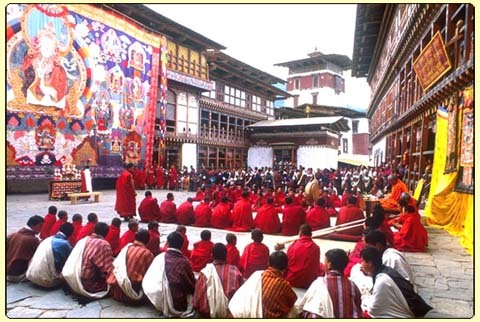 The most popular festivals are Paro Tsechu (March / April), Thimphu Tsechu (September / October) and the Jambay Lhakhang Drupchen in Bumthang (October / November). The Tsechu festival, which is celebrating at every Dzong. The major events are Mask dance known as Cham, which take place for 3-4 days and in honor of Guru Rimpoche. Performed by both monks and laymen, the Bhutanese people would have witnessed 12 episodes by the end of the festival. It is a must for every Bhutanese to see and understand every dance as these gains you merit and brings you luck. It is also a time when people from all over leave all their farm work, dressed in their best attires and jewelry and rejoice together. Day 01 : Arrival Kathmandu, check into hotel rest day. Day 03 : Fly to Paro & drive to Thimphu Overnight at Hotel. Day 04 : Sightseeing of Thimphu Bhutan, overnight at Hotel. Day 08 : Drive to Paro & Sightseeing of Paro Overnight at Hotel. Day 09 : Excursion to Taktsang Overnight at Hotel. Please note that all efforts have been made to confirm the festival dates with Association of Bhutanese Tour Operators (ABTO). The dates of the festivals change from year to year because they are based on the lunar calendar, which itself changes every year. The tour can be combined with Golden Triangle ( Agra , Jaipur, Delhi) in India as well. Also Bhutan and Sikkim Darjeeling tour can be combined.